This package includes transport to the wedding service venue. This includes transport to the wedding service venue. 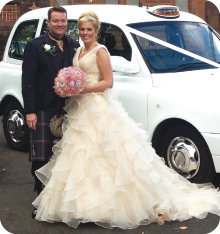 The wedding taxi will wait at the service venue and transport the wedding party to the reception. 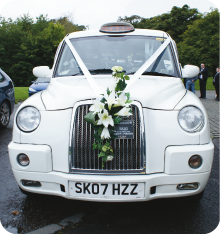 The wedding taxi will wait at the service venue and transport the wedding party to the reception via a separate photography location. We may be able to provide a double journey option which could reduce the number of vehicles required. Journeys out with Glasgow may be subject to additional traveling costs. Please contact us for a quote. A deposit of £50.00 per Taxi is required to confirm booking. Final balance is required 30 days before the big day. PLEASE NOTE: All traditional taxis can accommodate child seats which do not require ISOFIX.